Some students will hear directions to create a graphic representation of a reading and head for the hills singing. Others will moan and mutter things about "ridiculous art projects." But the popularity of one pagers with teachers lately is undeniable. If students can get over their hang-ups, they really learn a lot from processing what they've read in visual form with a one pager. 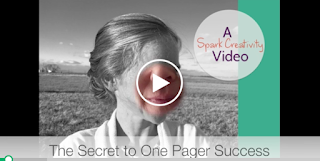 This short video will introduce you to the concept of one pagers and the easy template system I've created to help students succeed with them. If you decide you want to try it, you can get the FREE templates right here.